Greatness can be achieved we feel by any person or business by combining a passionate pursuit of excellence with a commitment to a specific meaningful purpose wrapped in a culture of discipline. Our intention in coaching our customers is to help them define their meaningful purpose, coach them on how to develop specific success routines and habits (Strategic Discipline: culture of discipline) at the same time help them maintain or increase their passion. What occurs as they apply Strategic Discipline and the Gazelles Growth Tools is a dramatic surge of confidence fueled by achievement. At the Australian Growth Summit Collins spoke to 12 questions you need to ask about your business to take it from good to great. According to the article Collins first addressed the question: what is a great enterprise, be it a great company or a great social sector enterprise? 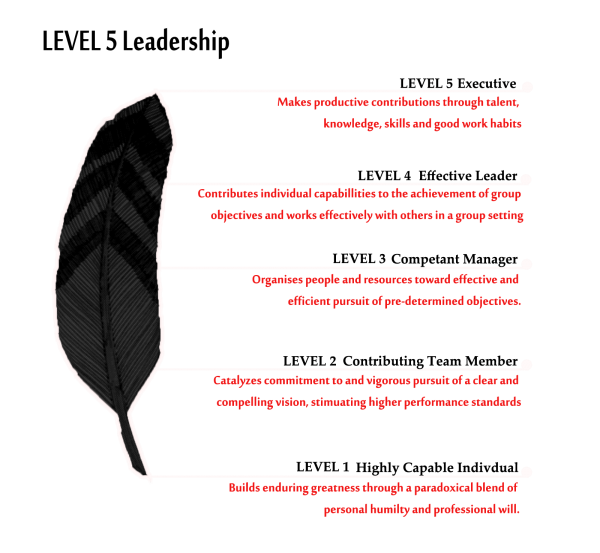 Not how you build one, but what is a great organization—what are the criteria of greatness? Here are Collin’s 12 questions followed by comments the story and from my coaching experience with our Gazelles customers to help you understand the value and impact of these questions. 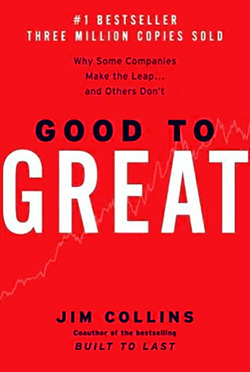 JIM COLLINS TWELVE QUESTIONS to help you make the leap from GOOD TO GREAT. 1. Are we willing to strive for Level 5 Leadership, and to embrace the 10X behaviors needed to build a great company or social sector enterprise? 2. Do we practice the principle of First Who, with the Right People on the Bus and in the right seats? This is really about following Collins first principle of Good to Great, First Who, Then What. Again from the smart company article Collins notes, “The single most important executive skill to have is clearly the ability to make excellent people decisions,” Collins continues that it’s not about the driver, “great leadership at the top doesn’t amount to much unless you have great leadership at the unit level”. 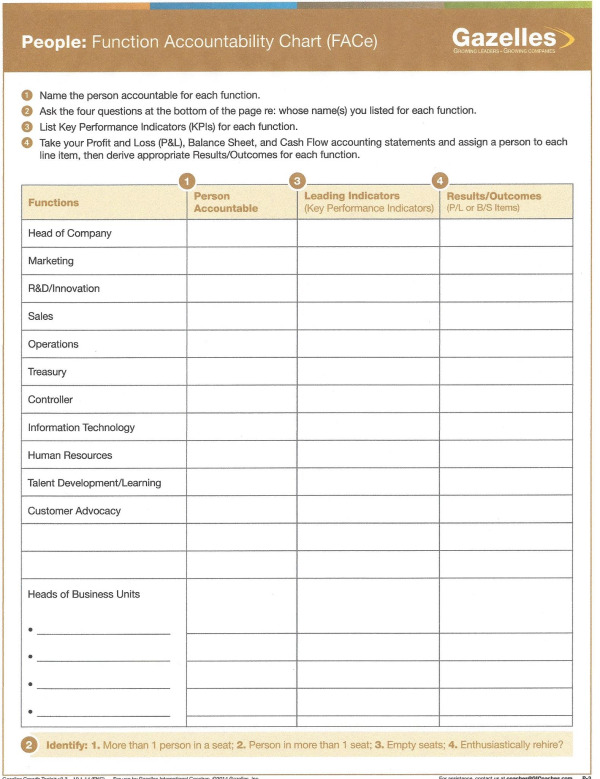 One of the first Growth Tools we introduce is our FACe People tool (Function Accountability Chart). It immediately identifies the roles in the company, where you have too many people occupying a position (no clear accountability), who has too many accountabilities (spread too thin), where there are empty seats (no accountability) and who you may need to replace (enthusiastically rehire). Getting the right people on the bus is the first step and helping our customers get this correct is the first step toward achieving greatness. There are 10 more questions to explore. 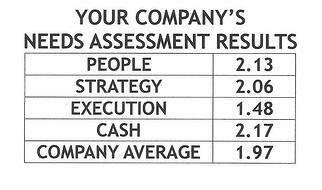 We’ll continue with this look at Jim Collins 12 questions to move your company from Good to Great next blog.